The Everglades consist of a large, swampy area located in southern Florida. 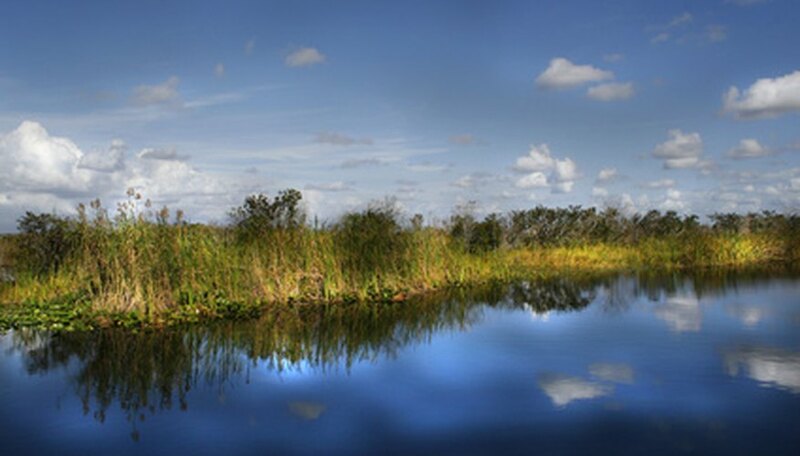 One of the largest remaining sub-tropical wilderness areas in the continental United States, the Everglades play host to a wide variety of unique plants. Algae play an important role in the Everglades, too, giving the water its green, somewhat slimy appearance. The dominant plant in the Everglades is saw grass. This sturdy grass occupies thousands of acres in an area stretching 300 and 60 miles wide from the Kissimmee River to Florida Bay. The needle-sharp leaves of saw grass grow in shallow waters where it reaches up to 6 feet or more in height. Fire helps saw grass thrive by limiting other vegetation and shrubs that grow along the shore, allowing the saw grass to spread and grow. The water of the Everglades features a gray, shapeless mass consisting of a variety of algae plants, including benthic algae. Benthic algae grow as single-celled organisms or in large masses. The mass, called a periphyton, offers small marine creatures an important food source. Aquatic organisms deposit their eggs in the mass. When the mass starts to decompose, it produces offensive odors. Alligator lily, also known as spider lily, grows along the outer edges of cypress swamps, thriving in swamps and marshes. The plant grows up to 2 feet in height featuring distinctive, fragrant white flowers with a yellow center that grow up to 8 inches in width. The flowers bloom in June through September on stalks standing above the strap-like leaves. A variety of beautiful orchids grow in the tree-island areas of the Everglades. The warm, humid environment of the Everglades helps orchids thrive. A narrow strip of forest swamp about 20 miles long and up to 5 miles wide, called the Fakahatchee Strand, produces the largest concentration and variety of orchids in North America. Orchids, including pine pink (Bletia purpurea), rat-tail (Bulbophyllum pachyrhachis) and water spider (Habenaria repens), grow in the Fakahatchee Strand, along with dozens of other unique varieties of orchids. Clusters of cypress trees dot the Everglades where they thrive in standing water. Two kinds of cypress trees, including the bald cypress and the pond cypress, grow in three distinct formations. One group grows in the shape of a dome with larger trees in the middle and smaller trees on the outside. Cypress trees also grow in a linear fashion, paralleling the flower of water in the Everglades. Stunted cypress trees, also known as dwarf cypress, form the third formation. Dwarf cypress trees grow in poor soil in the drier spots of the Everglades. What Types of Plant Life are in New Jersey? Which Are the Most Water-Hungry Plants?